After enjoying Kents Cavern, it may be a good idea to visit this restaurant. 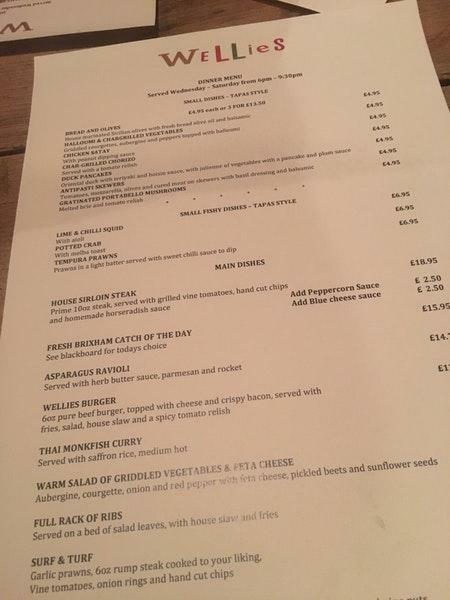 If you prefer British cuisine, then Wellies is worth checking out. At this place, guests can order nicely cooked prawns, tapas and smoked salmon. Based on the visitors' opinions, waiters offer good pudding here. The wine list is extensive, every visitor will find something that suits their taste. Delicious coffee is a decent choice. The success of this spot wouldn't be possible without the efficient staff. Fabulous service is something that people highlight in their reviews. This restaurant offers you democratic prices for yummy meals. The divine decor and cozy atmosphere let clients feel relaxed here. On TripAdvisor, guests say that Wellies is worth the 4.5 star rating. Beautiful refurb, more draught beers than before, good food, cannot really criticise anything apart from maybe staff training and ordering system. Have had my order, albeit only a coffee, forgotten twice over the last two weeks - maybe I'm just unlucky ! Maybe teething problems, but, would like to see the owner actually taking " part " in day to day activities if only briefly. There is a very old but true expression - " to gain respect you have to give respect ". Let's hope Wellies gets back to normal service ! Great refurb though - good luck !